The bike shop my sister hauled me to on Saturday has an interesting concept. Roll doesn’t sell bicycles as much as it sells services. It’s not a business model I’d ever considered. 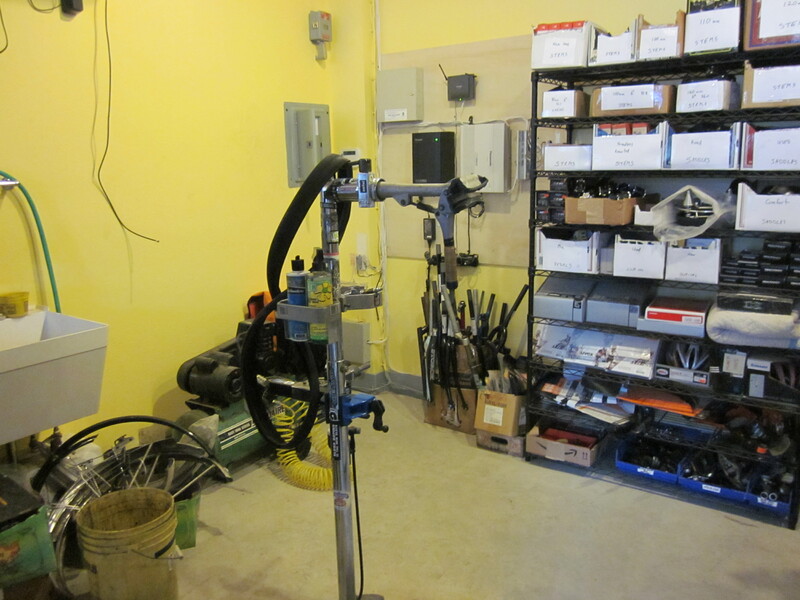 Most bike shops, to my mind, are kind of 20th-century enterprises. They tend to have limited websites, if any, and don’t bother to post inventory or prices anywhere. A few lack the attention to cleanliness and presentation that you would find at even the most slovenly used car dealership. Virtually all of them seem naively optimistic about the level of knowledge that new customers bring in the door. These aren’t always bad things—I for one would happily never set foot in a used car dealership again in my life—but they can be off-putting. It had been a long time since I’d ridden a bike when I bought one, and I certainly could have used reminders that I would need a lock and should pump up my tires once a week. There is a certain hobbyist flair to the bicycle shop (and in many cases, bicycle manufacturing) enterprise that leads me to believe that many of the people involved grew up thinking that “business” was a dirty word. 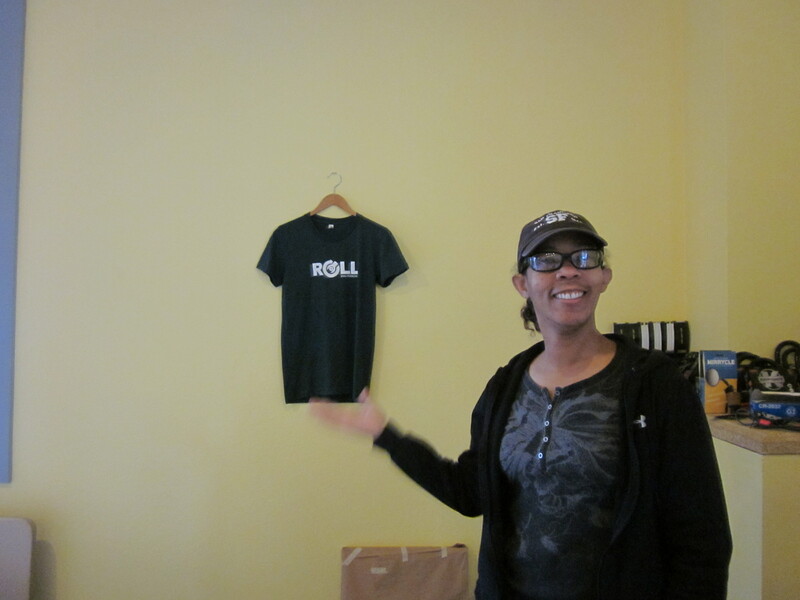 My sister was excited about Roll because the owners have thought about some of these issues. They recognized, rightly I think, that there is an abundance of stores in San Francisco that can sell you a bike, and that they didn’t want to compete with them. They do have a couple of bicycles for sale (literally: they had two bicycles for sale) but they are mostly about what happens after you buy the bike. They’ll repair anything, and by anything I mean that one of their current jobs was blasting the rust off a frame that someone found in an attic, which had been made by his grandfather, which they would then build up into a functioning bike. They posted the prices of all the services they could think of right on their website (admittedly not yet updated to include blasting rust from a 50-year old frame). They are open from 8am to 7pm so that you can drop a non-functioning bike off in the morning before leaving for work, and pick it up on the way home. You can make an appointment in advance online. Transparency! Availability! Online scheduling! What’s not to like? The owner we spoke with, Renita, was a long-time bike commuter who had evidently been saving up a list of her irritations with traditional bike shops for a while. 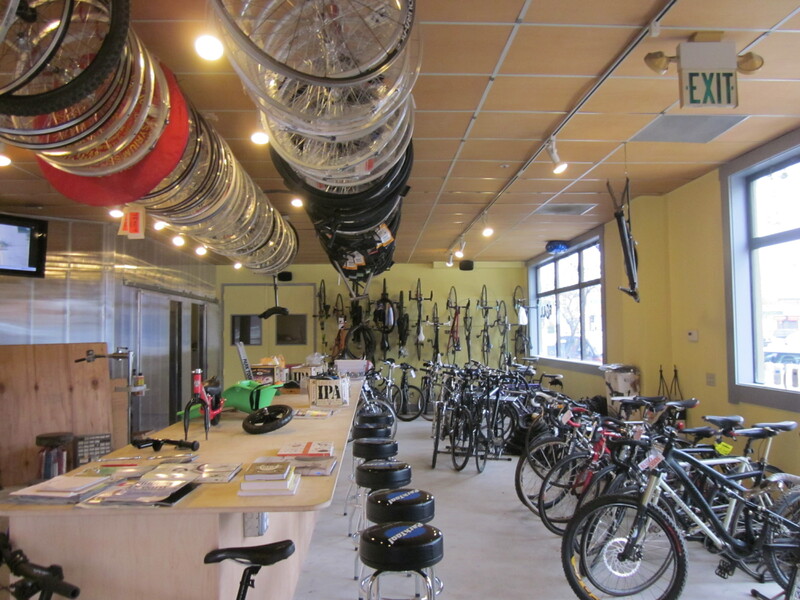 There is, for example, just one other bike shop in the city I know that keeps comparable hours; that is Warm Planet, which is open 7am-8pm M-F because they primarily serve Caltrain commuters (they offer free valet bicycle parking). Traditional bike shop business hours (Renita: “They’re better than banker’s hours”) have annoyed me as well; once when my tire was low after I arrived at work, I figured I might as well pick up a pump to keep at the office. But the bike shop near my office didn’t officially open until 2pm, and I was warned that I’d be lucky if they actually showed up by then. I had a class to teach that afternoon, so I ended up getting a pump during lunch at the hardware store in Laurel Village. Good thing I don’t have Presta valves. I mostly spoke to Renita, because Sam, the mechanic, was keeping busy working on bikes. They are evidently doing a land-office business, because they just hired a second full-time mechanic. 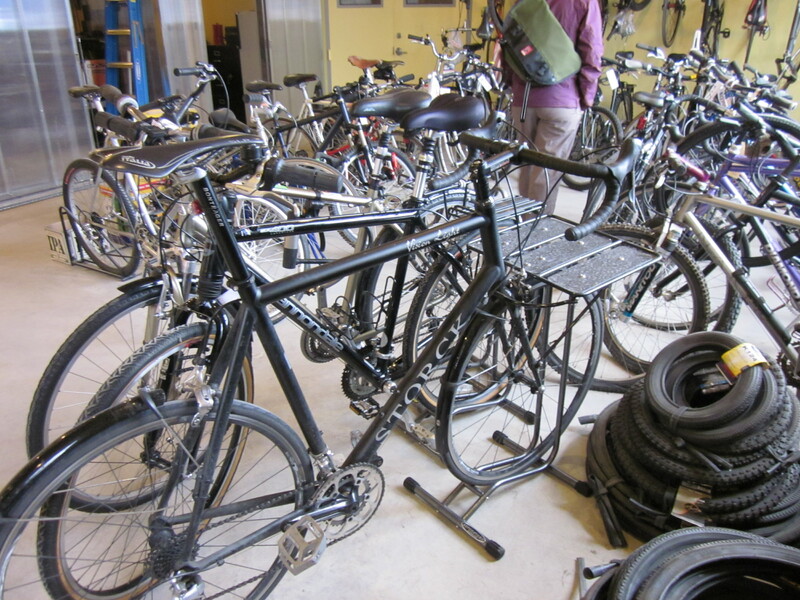 The shop was packed with bikes when we came in, but it was not overwhelming. Renita was justifiably proud of their setup, noting that they wanted to put the bike stands and tools up front, where everyone could see them, rather than hidden in the back. There is a back cubby, however, where they do all the scary things that no one wants to watch that involve tools like saws. I could not help thinking of this room as the operating theater. She was also proud that they had something else I had never seen in a bicycle shop before: seating and books, as well as a television that played bike-oriented shows (at the time we were there, an incredibly boring bike race). I am used to standing around bike shops waiting to be helped and staring at the walls by now, but have never enjoyed it. Including seating was an inspired move, particularly given that they wanted a space where women and kids would feel welcome. My sister and I agreed: mission accomplished. They even have a child seat in stock, a Topeak. It’s not the model I would have chosen (either Bobike or Yepp would be better) but it’s nice that they made the effort. And they aren’t snobs. Like Sosuke in Ponyo, they love all the bicycles. Hence the custom Seven we spotted between two decidedly-not-custom bikes, a Giant and a Cannondale. We don’t live anywhere near Potrero Hill and getting to this shop would be a five-mile slog for us. This would not be ideal if our bikes actually needed repair, but I understand why locals seem to be swarming it. My sister has a bike mechanic hanging out at home in the form of my brother-in-law, but I imagine she’ll be back for larger jobs he’d prefer not to do. Overall, although I can’t speak to the quality of their work from just wandering around taking pictures, I was impressed. 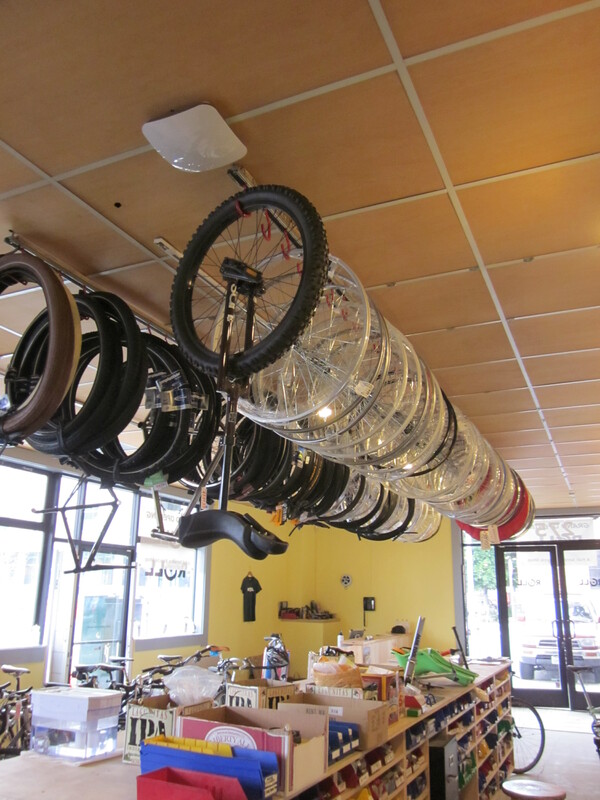 This is a different kind of bike shop, and it’s different in a good way. There’s definitely a market for family and commuter in the Cambridge/Boston area, what with the density of such riders. I hope I find a Roll and Everybody Bikes nearby. I’m surprised to hear that! I thought that Harris Cyclery was carrying on Sheldon Brown’s torch, and he seemed very family friendly in his writing, at least. I hope you find a good shop, too. I’ll check it out– but I’d have to drive there. Ugh. Have a nice trip to the NW. What’s the logic for not growing to meet demand? That’s bizarre. 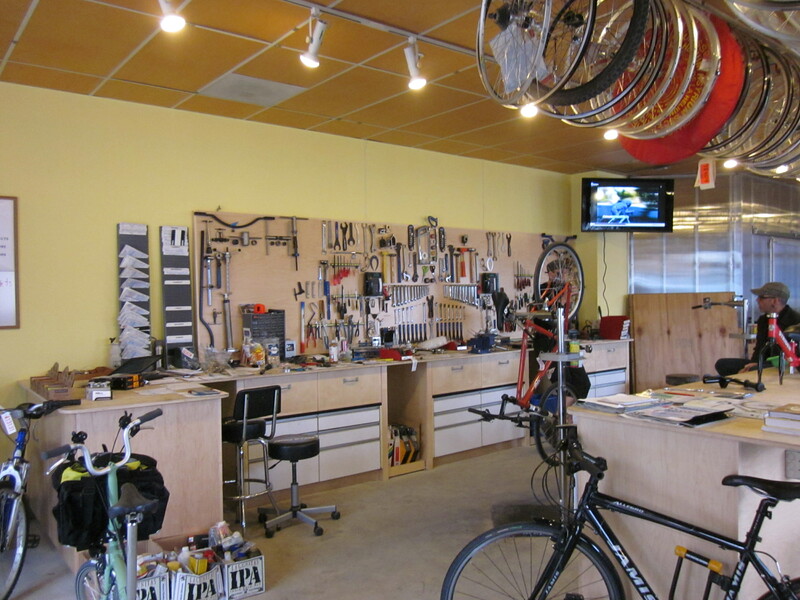 Although maybe it’s consistent with the general attitude that a bike shop is a hobby and not a business.